Offensive tackle Brennan Williams was drafted in the third round out of UNC in 2013, and spent time in camp and on practice squads with the Texans, Jaguars, and Patriots. After his football career ended he began training under Booker T., and in August of this year signed a developmental deal with WWE. (His father is the first commenter under the story.) Williams has been performing with NXT, but that doesn’t mean he doesn’t have time to put together one heck of a birthday party. OK, good start. Looks like party favors (?) for guests inside personalized Poké Balls. Damn! 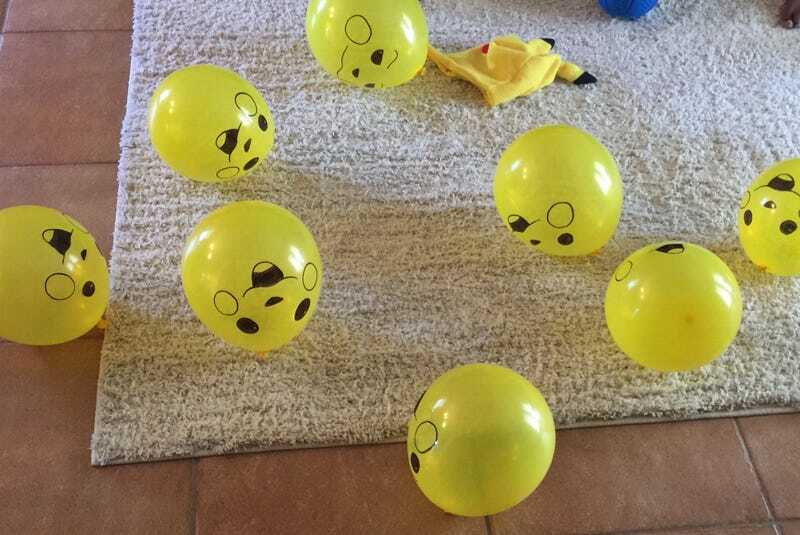 Hand-drawn Pikachu balloons. That’s a lot of work! But those are really high-quality Pikachu faces. D’awww. And is that a Poké Ball made of cupcakes? I think it is. Anyway, this is excellent dadding. Brennan, my birthday is in March. I’m big into dinosaurs this year. Let’s talk.